nice wallpaper, it looks very good, the stairs are very nice and the composition of the wallpaper is very good. wow.. it looks really good! the background looks sooo pretty *_* im jealous! I dont know how you can make such awesome backgrounds =P but i think the scan is a bit too yellow. but other than that, it looks gorgeous! Spectecular? Hmm...I would say yes. Maybe make the buildings to be the original state, which is the perfect view, with no blurring effect. But maybe that's just me. Agree with what Asahi had mentioned, the scan could do more of a coloring besides yellow. Great wall you have made really beautiful work. and really nicely fiting in the wall. So you have really made fantastic job. ohh its very nice lol..
mhmm the two buildings are quite blurry..
and the clouds at the top are a bit too dark.. Kisses and Hugs from your Argentine friend! I like the concept a lot! The stairs are leading the way to a kingdom in the clouds. I also like the name of the wall. It's fitting perfectly. 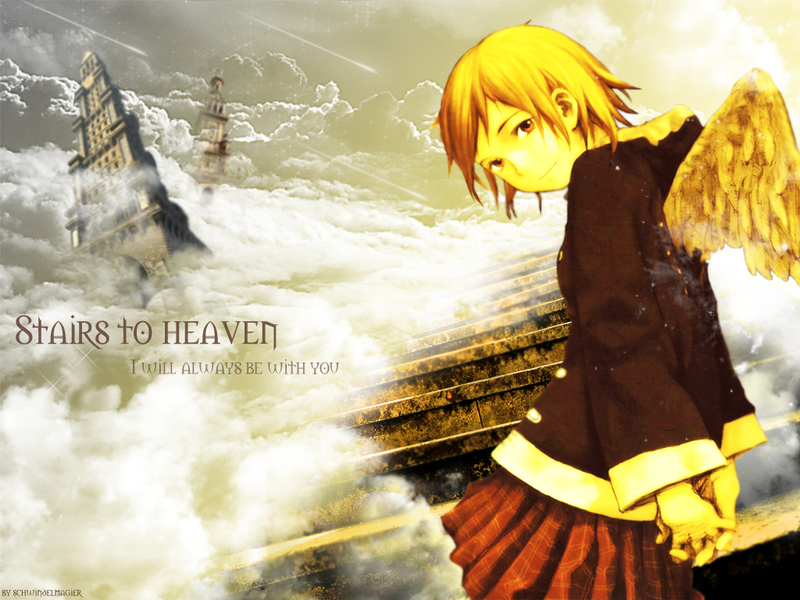 Is a very nice wall, i like the clouds and the stairs in there n_n!